Yesterday my dad came to visit and we once again set out to go shopping. And all I bought was jewelry…not that I’m complaining. The first pieces I stumbled upon were some glorious additions to my WWII Sweetheart collection, which I wrote about in my last post. The gold tone V brooch has red, clear and blue rhinestone accents that make up the Morse Code for the letter V. The wood, hand painted, screw-back sailor boy earrings were just too darling to pass up, and I was shocked to find that the screw pieces were made of plastic! Talk about really saving the metal for the war effort! 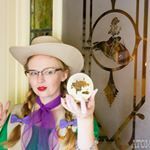 My third piece was this wonderful little plastic cowboy hat…Along with Sweetheart jewelry, I am helpless against western themed jewelry – it makes up a fair amount of my brooch collection. I have wanted this piece since my friend Angelina first shared the ad for it with me on Facebook a few years ago, and we made it our goal to find our very own. Well, I found mine, and with matching earrings to boot. The price was out of comfort zone, but not unreasonable, and my dad knew it – so he purchased it for me, quickly followed by “Happy Birthday” – even though my birthday isn’t until April. I know the piece is worth it though since I’ve only run across a handful on-line, and up until now had never one in person. I love how versatile the piece is – since it’s a double brooch, the gun and holster can act either as one, with the gun sitting in the holster, or separately as seen in the center picture, and I guess it could be even worn as sweater clip. Sweetheart Jewelry	Pack up, Let’s Fly Away! Aw! What a sweet Dad you have! The brooch and earring set is AMAZING! I love it. Your dad is awesome! I love that you’d been searching for the brooch for a few years and finally found it. Your new layout has finally loaded for me, and I love it! The banner is gorgeous!